This section is designed to provide developers a solution to set graphic overlay in PDF file with C#, VB.NET via a .NET PDF library Spire.PDF for .NET. 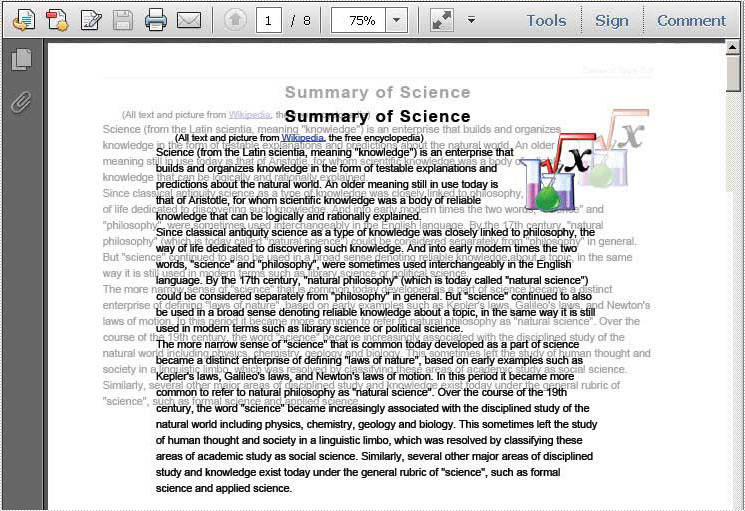 Spire.PDF for .NET enables you to set graphic overlay for PDF pages in an easy way. In order to see content in both PDF files, we can set the transparency for the overlay. Now, let us see the code detail step by step. First, we need to load two PDF documents from system which are used for creating overlay PDF document. Then, we can create the page template as one page of the first PDF file. In my project, I set the first page in the first PDF document as the template. Finally draw this template page into every page of the second PDF file by this method: PdfPageBase.Canvas.DrawTemplate(PdfTemplate template, PointF location) and set the transparency for the page: PdfPageBase.Canvas.SetTransparency(float alphaPen, float alphaBrush, PdfBlendMode blendMode). I have introduced one solution to set graphic overlay for PDF document, I wish it can give you some insights. If you have problem, feedback and suggestions, please do not hesitate to put them on E-iceblue Forum, we will give prompt reply. Spire.PDF for .NET is a PDF application which is designed to perform processing tasks on managing PDF files. It is completely written in C# but also support VB.NET.